Did the spider study the Vedas? or the snake consult law books? Did the elephant labour at spiritual disciplines? or the hunter intone a mantra? This poem, from Dhurjati's Śrīkālahastīśvara-śatakamu, a seventeenth century Telugu text, rightly creates an interesting intertextuality between bhakti poems, hagiographies and the sthalapurāņa of Kalahasti and Kannappa. The reference to the animals associated in the sthalapurāņa and to the hunter, Bhakta Kannappa, in a single verse, not only establishes an intertextuality between the sthalapurāņa and hagiographic traditions but also creates an equation between the bhakti of the hunters, animals and animal-like bhaktas. The first four lines of the verse question the futility of orthodox learning as the spider, snake, elephant and the hunter bhakta did not have any such knowledge. Subsequently, it states in a declarative tone that the learning need not have to be the source of awakening. Then, while negating all such orthodox approaches to the realization of God, the poem upholds the belief that devotion, even performed sacrilegiously, could liberate everything that lives on the earth. The poem epigrammatically captures the discussion and analysis that has been done in this essay within an ambivalent trend of a subservient devotion and subversive revolt in operation simultaneously that has been variously conceived as counter-structure, dissent and non-āgamic, pratilōma. Varthamanapusthakam, which was written in the 1790s by Father (Fr) Thomas Paremakkal as an account of his travel along with his friend Mar Joseph Kariyattil to Madras, Africa, Brazil, Portugal and Rome and often hailed as the first travelogue in an Indian language, has been used as a literary medium by the author to ventilate his dissent and anger against the hegemonic attitude and the colonial fabric which the European religious missionaries set up for the church in India, particularly for the St Thomas Christians of Kerala. Arguing vehemently that India should be ruled by Indians and not by foreigners, he demands, as early as 1785, that Indian Christians should be ruled not by European religious missionaries but by Indians. Within the larger format of a travelogue detailing meticulously the socio-economic and political processes of the several countries he visited in Africa, South America and Europe, he argues his case by showing how the foreign missionaries, fearing reduction of the span of their power and authority, did not want to have another bishop for the St Thomas Christians and how the innocent priests of this community were brutally killed (as in the case of Chacko Kathanar of Edappilly, who was starved to death in their jails) and the very community often fined for the blunders and crimes of omissions and negligence of these foreign missionaries. Fr Thomas Paremakkal and Fr Joseph Kariyattil made their travels to Portugal and Rome based on the decision of the general body of the St Thomas Christians taken at Angamaly, for the purpose of informing the Pope and the queen of Portugal of the various discriminations, sufferings and difficulties that this community experienced over a considerable period of time from the foreign Carmelite missionaries working in Kerala. As the general meeting of the representatives of this community at Angamaly was dominated by feelings of anger and animosity against the European religious missionaries and the European bishop working in Kerala, the travelogue has anti-Europeanism as its basic thread, critiquing the hegemonic and colonial fabric of the church set up by the European missionaries. Stressing the need for going back to the pre-Portuguese days when democratic institutions of yogams (representative body at the grassroots levels), mahayogams (representative bodies at higher levels) with jathikkukarthaviyan (head of the community) existed among this community for their administration, instead of one-man centred or European notion of bishop-centred administration, the travelogue challenges the notion of authority that the European missionaries had set up within the colonial fabric they had created for the Church of the St Thomas Christians. The great uprising of 1857 brought about a significant change in Indian society. This incident led to several socio-political developments in the Indian subcontinent. However, the impact was greater on north Indian Muslims, both socio-culturally and politically. For centuries, Delhi remained the centre of power, and for over six centuries Muslims ruled this region. To the common people, the Mughal dynasty was very important, given their long emotional connections with the emperors, irrespective of whether the emperors were strong like Akbar, Jahangir or Shah Jahan, or inconsequential like Bahadur Shah Zafar. For the people, the king was their anndata, a divine power who would bring back their lost glory, and therefore a figure of rebellion, whether real or symbolic. This perception helped the Mughals to consolidate their presence over a long period. Although the country was fragmented into several small states after the disintegration of the Mughal Empire, these newly-formed states could not erase the memory of Mughal glory, specially after their painful experiences with regional power. The erstwhile subjects were filled with despair and frustration, which was why the spark of rebellion caught on so quickly. Love is central to the path of devotion. In striking contrast to sectarian and communal schisms and conflicts which are hate driven, the path of devotion has been marked by love that is intensely physical and at the same time, transcendental. Humanism and universal compassion are often the most pronounced features of the devotional way of religion. The chief moods of bhakti are union (sayujyam) and separation (viraha). This, on the one hand, results in love poetry that is often characterized by viraha or separation and unrequited love. On the other hand, devotional poems in the love mode can be passionately sensual and filled with the ecstasy of union. Scholars of religion and spirituality term the intense love of the devotee for God as ‘bridal mysticism’, although bridal mysticism is only one, albeit the most sensual, of the many ways in which the devotees relate to the Supreme. Karaikkal Ammaiyar, whose love for Shiva is expressed in praise of his cosmic dance on the cremation grounds of Tiruvalangadu, is a striking example of love that is couched in the metaphor of the terrible with the saint herself as the ghoulish figure presiding over the cremation ground. Here, love is passionate but horrific and awe inspiring rather than sensual. Several myths and stories tell of women's resistance to male-dominated society. In any discussion on gender, aspects of patriarchy and caste hierarchy—particularly in the Indian context—cannot be overlooked. Janaki Nair connected these two factors with the legal rights of Indian women. Patriarchy often perceives women as merely sources of entertainment and child-producing machines. 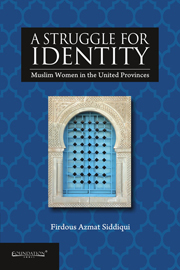 This chapter explores the diverse shades of the lives of Indian Muslim women. Indian Muslims lead lives that are very similar to Hindus in most respects, especially vis-à-vis customs and living conditions. A number of local customs, not inscribed in the Quran, prevail among Indian Muslim—chhatti, chilla, manjha, rasm-e mehndi, chauthi, soem; and some obligations such as aqiqa, khatna bismillah khawani and aameen. Some ashra'f Muslims practised only those customs inscribed in the Quran and Sunnah. The dearth of evidence on ajlaf and arzal girls (save what is available in European accounts and oral history) creates a problem: How are they to be depicted in writing? A number of patriarchal folk songs sung on different occasions reflect how these were celebrated in Muslim families, and what the status of women in society was. In the nineteenth century, the British were occupied with the question of becoming socially acceptable, as they had already established political and military sway in India. It was in this context that the servants of the East India Company, merchants, adventurers and missionaries who arrived in India from Europe attempted to enter the zennana, in much the same manner as the ruling Indian elites. These foreigners adopted the ways of the ruling class, and thus demonstrated a preference for the Muslim section of Indian society. This book is an attempt to understand the social and economic profile of Muslim women in India and to shed light on the conditions of Indian Muslim women in the United Province particularly after 1857. This period is significant for Muslim society as it was undergoing social and economic transition especially with the Mughal dynasty reaching its end. Besides, the book critically discusses the influence of how the new colonial judicial system weakened traditional customs and questions whether this legal system was beneficial to Muslim women or whether it enhanced its complexities. In contrast to sectarian movements across the world that have been fundamentalist in terms of their ideology and locked in conflicts with those who worshipped 'differently', dissent movements within devotional streams were characterized by the qualities of universalism, humanism and love which cut across communal, caste and gender lines. The primary focus of this volume is to present the morphology of dissent within devotion. In the process, the traditional tropes of borders and boundaries get corroded. The normally visible communal, class, caste and gender divides are rendered fuzzy. Equally significant is the emergence of dissent within dissent movements, as these movements begin to petrify into rigid doctrinal positions. This book seeks to provide a counter-perspective to the well-known and well-trodden school of Marxist historiography which locates religion firmly within the existing socio-economic order. 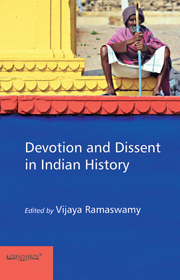 However, the editor has not conceived of a tailored closure to these two positions and this volume contains essays that explore the notion of devotion as being embedded in dissent, either religious or social. The Bhakti movement in South India initially emerged as a dissent tradition against the orthodox Vedic Brahmanism and stood for social equality. But at a certain point in time, bhakti becamean ideological instrument in the hands of ruling elites and justified social inequalities. For the sake of its survival, the radical flavour of the Bhakti movement gradually receded to the background and the movement came to depend upon the patronage of ruling elites. The essay explores how the cittar or siddha tradition, which nurtured radical views against social injustice, came to fill the vacuum created by the degenerate Bhakti movement and of how such voices dissent eventually gave birth to an alternative value system and a new mode of devotion. It is argued that the cittar tradition cannot be studied alone as a theological response to bhakti but there is a need to understand how it represented the overall contemporary discontent of the common man against the socio-political institutions created by the bhakti ideology. Hence, the essay also studies epigraphic references to people's resistances against socio-political institutions and thus looks at their relevance to the dissents in cittar literatures. The picture of society indicated in the early Tamil literatures shows us that kin relations and the ideology of heroism defined the early social formation. But the dominant scenarios of early social formation withered away by the beginning of the first millennium AD. The characteristics and practices of early social formation, such as predatory politics, cattle raids and warfare, sharing food with commoners and even kinship bonds in production, had lost their grip. Conversely, a new social formation, structured by the ethos of plough agriculture, began to develop. As production activity was modelled more on the agrarian economy, values and institutions of the agrarian social relations were produced and reproduced. This led to the growth of composite social relations in which the state and religion were integral. This chapter tries to understand and analyse the impact of the British judicial system on the rights of Indian Muslim women in the late nineteenth century. Examining the problems faced by Indian Muslim women, it looks at the positive and negative aspects of the British judicial system, as well as the response of the Muslim community to it. Bernard Cohn stated, ‘It cannot be denied that in India the laws that exist today grew out of a colonial legal system, with its bipolarity of authority and norms that derived from the indigenous and the colonial systems.’ This chapter will also focus on the development of the Indian legal system, and its impact on women. Several of the problems that Indian Muslim women faced arose from the British perception of Indian Muslims. Taking all Muslims all over the world as one monolithic category, the British assumed that Indian Muslims were similar to those they had come in contact with in Europe and other Arab countries. They were unclear about who a Musalman really was. The British referred to Muslims as ‘Moors’ because of the language the latter used. The word ‘Moor’ was considered pidgin, or, as Gilchrist thought of it, as barbarian gabble. Another British fallacy was assuming that Indian Muslims could be understood from the Holy Books, and that religious dogmas were the Muslims' only concern. A continuous religio-socio-literary phenomenon, such as the Varkari tradition, which can be traced back to the late thirteenth century at least, may be seen in categories that have been termed as ‘a history of cultural memory’ or ‘mnemohistory’. The public memory of traditional societies is constructed from a dynamic version of the past that cares not so much for historical accuracy or fact, as for the continuing significance that the past holds for the present. The relationship of the present to the past is dynamic and is constantly shaped by the interpretations of several texts and narratives, written and oral, which live on in a kind of a living debate, extending over centuries. Chronicles of pre-colonial Indian figures, especially those from the domains of religious and devotional sects, and the literary works attributed to them, are not recorded in ways that are amenable to biographical reconstruction, but live in the collective memory of communities. Sanctified and mythologized in hagiographies, these lives may be said to be socially constructed. The contours of the life of a proto-historical figure take shape from the values and norms that constitute that community. In a sense then, if one were to trace the lives of two poet saints from the Varkari sampradaya, separated from each other by a couple of centuries, yet connected in ways that this essay hopes to explore, the narrative would also be a reconstruction of the culture of the community that had kept the memories of these lives alive. The Roman Catholic tradition has a solid reputation, at least within the Christian world, of conservatism and lack of flexibility. Even in contemporary media, the memory of the Grand Inquisitor is never far from the background of the frequently presented figure of the present Pope. With its doctrine of ‘infallibility’ and authoritarian structure, Catholicism seems to throttle any attempt to express dissent not only in religious matters but, often enough, also in social movements. The history of the last two centuries shows how often official teachings have tried to support the established order and block change in religion. As evidences, one need only read the famous Syllabus of Condemned Errors, issued by the Vatican authority in 1864. In more recent times, the rejection of priestly ordination for women seems to be another case in point. However, even within this conservative tradition, there are always movements rooted in new understandings of devotion and faith that make space for themselves within the church, often with difficulty. I would like to present here two important movements in Indian Catholicism, one at the opening and the other at the close of the twentieth century, and in this context, examine how the Indian Catholic Church has been coping with change and has strengthened its identity. In the history of India, particularly of South India, we see the remarkable life and teachings of Narayana Guru. He confronted the course of history and shook the conscience of the very people who had been exercising the worst kind of social iniquity on the authority of an assumed caste superiority. He boldly encountered the orthodoxy and performed the miracle of arousing self-esteem among the downtrodden. Out of the clutches of an age-old custom, he brought out a new civilization, which is fighting for equality of opportunity and social justice in its own right even today. Narayana Guru was one of the epoch-making seers of the modern era, who has dynamically effected a radical change in the social, moral and spiritual value–visions and behavioural patterns of his contemporaries in India. In this essay, an earnest attempt is made to focus on the originality and scientific validity of the Vedantic teachings of Narayana Guru, by examining how he looked at religious differences and casteism, exploring possibilities of impacting discourses on religion and caste, in order to animate processes to undermine religious feuds and caste prejudices. The Guru's religious and social reform activities were an outright application of his philosophy of ‘Oneness of Consciousness’ (according to Narayana Guru – the ultimate reality is arivu or consciousness). But this real causal force behind them is not observed by the historians and people of India. This imaginative theme will, of course, be parsed in several ways in the essays that follow but what intrigues me about it is the various ways in which it can be parsed. To begin with, one could speak of dissent without devotion. And to this category would belong, surprisingly, both the atheists and the transtheists of the Indian religious scene. Thus, we have dissent sans devotion when the atheist denies the very existence of God and thereby of devotion to Him. But even here we may be need to be careful, for one must distinguish between what is personal or impersonal in its ultimate formulation, and the personal or impersonal quality of the devotion towards the object of that devotion, whether personal or impersonal. Four possibilities emerge. First, the possibility that the object of the devotion is personal in nature and our attitude towards it also personal: as when we pray to a god or goddess with devotion – the very core of bhakti. Second, the possibility that the object of devotion is impersonal and our attitude towards it is also impersonal. Thus, nirvana, as the summum bonum of Buddhism, is something Buddhists would be devoted to but, at least in Theravāda Buddhism, the goal is impersonal in nature and the attitude of the seeker after it is also impersonal, the way a scientist may approach an object of investigation. Similarly, in Advaita Vedanta, the ultimate reality is pure consciousness and one seeks to ‘know’ it. This knowing is not in the nature of personal knowledge, although it is a person who acquires this liberative knowledge. Amongst one of the greatest religious personalities of India, Ramanuja has an enduring reputation of a social reformer who dared to defy the Brahmanical orthodoxy of his times by democratizing temple worship for the marginalized castes of society. One of the radical steps he is supposed to have taken in this direction was to shout out the dvaya mantra, exclusively meant for the brahmins, from the top of the temple tower at Tirukkottiyur so that everyone, irrespective of their caste status, could hear, learn and recite it. Thus, such occurrences in the life of Ramanuja have delineated him as a rebel saint who dissented against the Brahmanical convention, caste hierarchy and political order of the day, and simultaneously evolved the Vishishtadvaita exegesis, developing a structure of devotion that involved large sections of society in the attainment of salvation and direct accessibility to the divine. Hence, the association of Ramanuja with dissent and devotion has been the central belief of the Shrivaishnava community of South India, for whom Ramanuja was the founder, who organized the community and gave it an exegetical basis through the Vishishtadvaita Vedanta. Thus, one knows about Ramanuja's life, his beliefs, his catholicity and compassion. We know what his biographers tell us: in this case, the hagiographies whose authors were located in a particular context and, through Ramanuja's attitude of dissent and devotion, were putting forward a certain vision for the Shrivaishnava community and attempting to create a particular kind of collective consciousness within the community. The making of the Punjabi society, a frontier society, for the last 3,000 years has been a fascinating story of complex paradoxes. If the Punjab served as a theatre of warfare, it has also been an abode of sages, seers and sant poets. Perpetual political and ideological contestation did not necessarily close the doors to meditative contemplations. Even if the established religions, including the new ones, could not avoid sectarian manifestations, the universal spirituality kept the doors open for egalitarian inclusiveness cutting across all divisive lines. If the rise of Sikhism as a new religious ideology was a popular expression of egalitarian urges and came to offer respectable space to the untouchables from the sixteenth to the eighteenth century, it also degenerated to Brahmanical caste praxis by the mid-nineteenth century. Meanwhile, the Dalit sant poets, as part of the tradition, offer a seemingly paradoxical response of devotion and dissent. We have four major Punjabi Dalit poets emerging from the last quarter of the seventeenth century to the first quarter of the twentieth century who were soaked in the contemplative world of knowledge and spirituality, while seeking an egalitarian and just society. The Punjabi Dalit literary tradition begins with Bhai Jaita alias Jeevan Singh (c. 1655–1704), who became part of the guru's household as he had carried the severed head of Guru Teg Bahadur from Delhi to Anandpur, and in his late years, composed a devotional epic poem, Sri Gur Katha, around Guru Gobind Singh's life at the turn of the eighteenth century.